Do You Need Writing Services? I provide writing and publishing services. My favorite thing to do is help new writers get their books on Amazon. Read about that here. Please use my contact form if you'd like to learn more. I'll get back to you fast. ​Have you considered advertising on Big Sky Words? Take a look at the traffic the site gets. According to Google, it's around 700 unique visitors a day. According to the site's analytics, it's about 800 unique visitors a day. It means that 700 to 800 people come to the home page each day. They see the ads that are there. That could be your business that they're seeing. ​I'll make you a homepage ad that will run for 1 week. That means you could get anywhere from 5,000 to 7,000 unique views on that ad. Use this convenient PayPal button to pay $20 for that ad. I'll email you on the specifics. 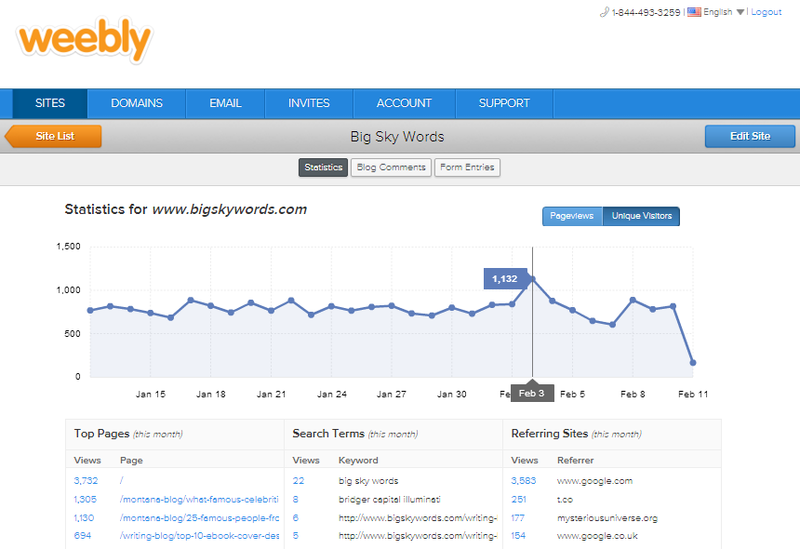 Get your business noticed in a whole new way - advertise on Big Sky Words today!